Certain historical places require a visit, so you will never forget them. Valley Forge is one of them. Just a short distance from Philadelphia, you can find one of the most notable aspects of the American Revolution. The day we visited, it was during the winter and freezing. Experiencing the site of the encampment of the Continental Army from 1777-1778 on this cold day allowed us to reflect on the severe conditions the soldiers faced. As always, we started at the Visitor’s Center. Like many other National Park Service sites, we viewed a short film and explored the exhibits. Armed with new knowledge the boys and I picked up a map and started our audio tour of the park in the comfort of our car. The kids enjoyed Muhlenberg’s Brigade. They were able to go in and check out the reconstructed soldier huts. They quickly realized how lucky they were to have warm beds to return to at home instead of the bunks that were in the huts. Moving along, we then proceeded the rented house by George Washington, which became his headquarters. The room is furnished, and there is also a stable and a train station, which both have additional exhibits. Unfortunately, since we were there in the winter, we were unable to tour Varnum’s Quarters. It is open all week during the summer and weekends in the fall and spring. 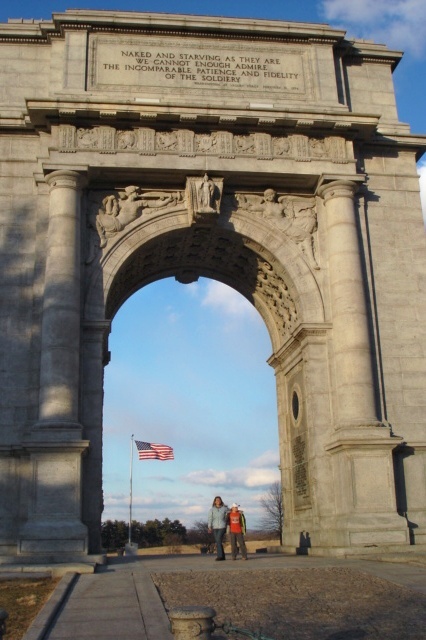 Inspired by the Arch of Titus in Rome, the National Memorial Arch Twas built to honor George Washington and his army that secured our nation’s independence. It is beautiful. 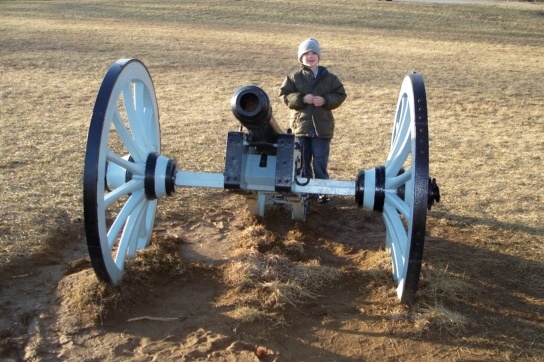 The boys favorite part of the day was checking out the cannons at Artillery Park and the soldier’s huts. During the summer there are living historians and re-enactments at Muhlenberg’s Brigade. 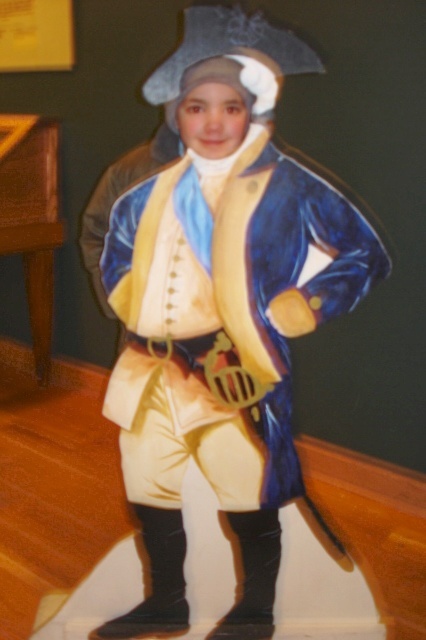 If you are planning a trip to Valley Forge, it is smart to check out their website at www.nps.gov/vafo/index.htm or their Facebook page at www.facebook.com/ValleyForgeNHP for a schedule of events. You may also like to take a 90-minute trolley tour which is $13 for children 11 and under and $16 or adults You can purchase these tickets on-line. 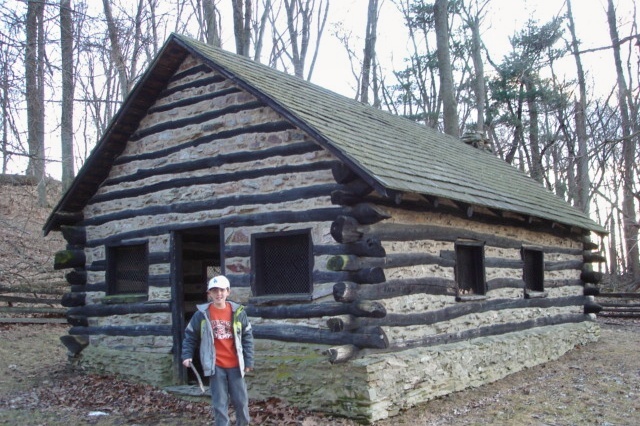 Writing this post reminded me of a great time we had at Valley Forge, and I realized I would like to re-visit this summer to experience it in the warmer months. To change it up I plan on checking out the hiking and biking trails. I look forward to taking in a little history and nature with my son. Maybe we will see you there!